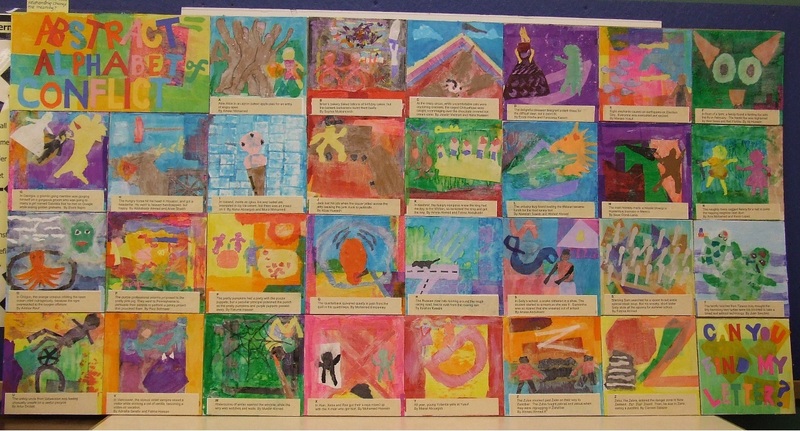 The 8th graders of Roseway Heights K-8 made this wonderful mural. Three 3ft. by 12ft. 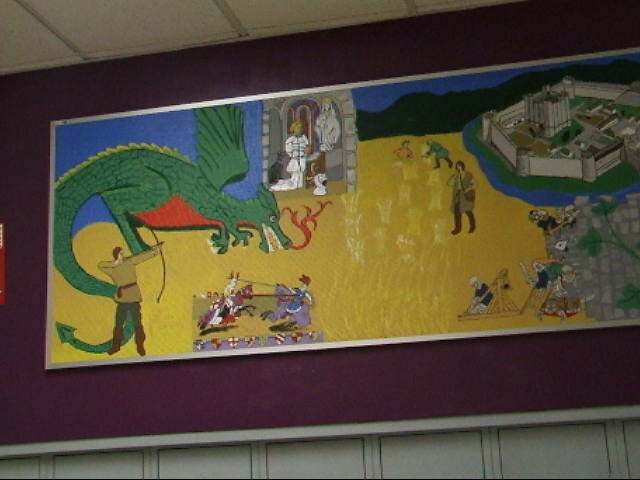 bulletin boards were painted by 7th and 8th graders. 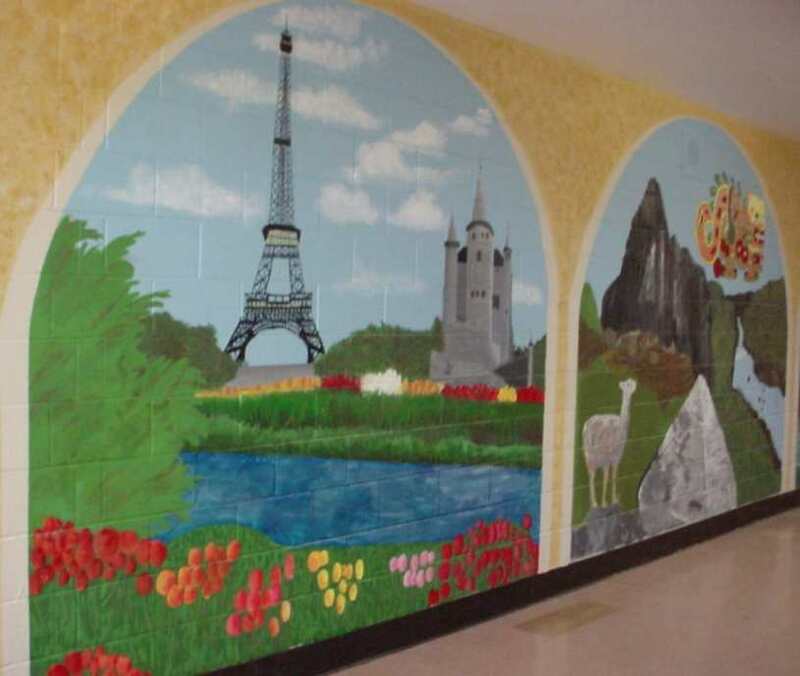 Teachers Kurt Krohn and Jeff Gentile provided background wall repainting, and installation. The themes are the core subjects: A timeline of history from cave man to Roman times, Medieval life and castle, and The United States. Jackson ESL teacher Anne Marquard took steps to make this a deep English language learning experience. The core concept was conflict. She had the students listen to the symphony "Peter and the Wolf" to demonstrate that sounds can convey mood and story without words. She showed a book that demonstrates the use of abstract shapes and color to tell the story of "Little Red Riding Hood", and had the students make an abstract story board of "Peter and the Wolf". Next she had each student choose 50 words starting with their assigned letter of the alphabet and find those images on Google. Each student made torn paper compositions of the alliterative sentences they wrote using some of the words they had found. The sentences had to show a conflict. Then I helped the students create 12" X 12" torn colored tissue and other paper collages concentrating on color choices and abstract shapes to illustrate their sentences. Over two years Gregory Heights Middle School students toured the river by boat to learn about the watershed. They then sketched, photographed, and painted their impressions. 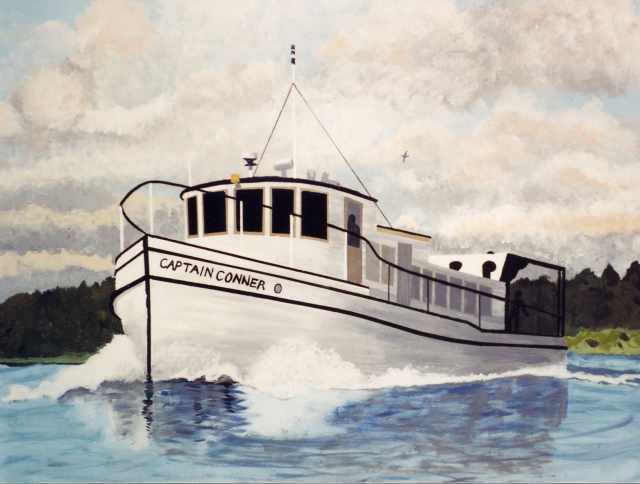 800 students spent two years touring the river by boat to learn about the watershed. Then they sketched,	photographed, and painted their impressions. 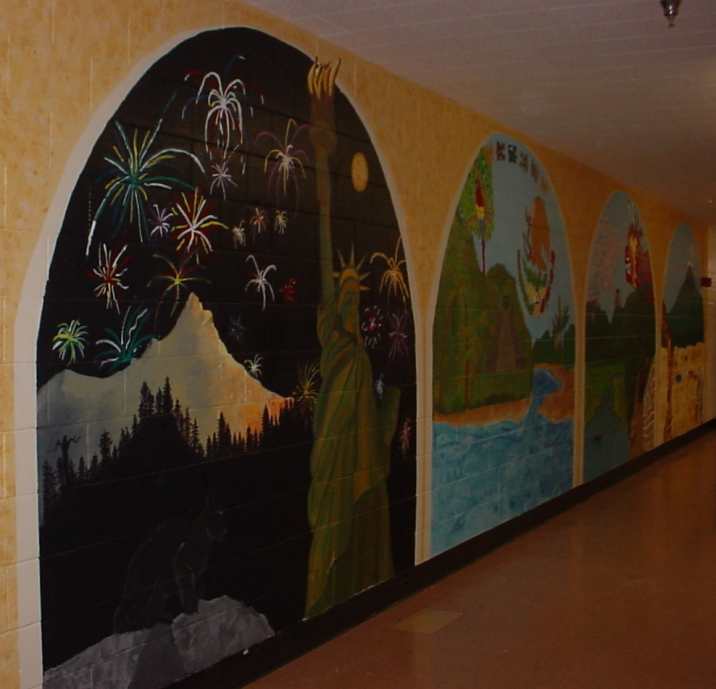 The murals are on both sides of a 340 foot main hall. Jeri Fitterman, 6th grade teacher, conceived the idea and wrote over 20 grants (and received 10) to fund the field trips and mural. 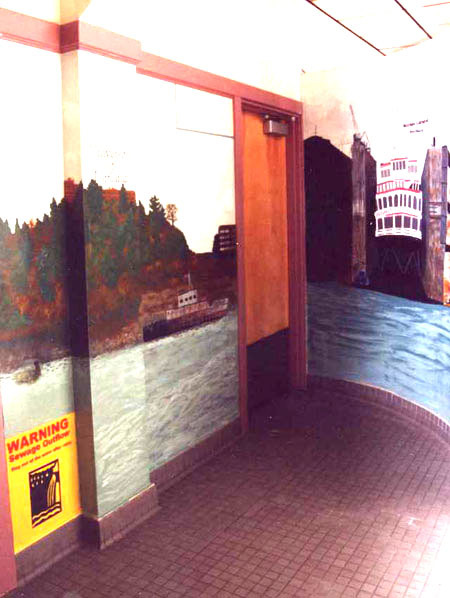 Located at 7334 NE Siskiyou in Portland, Oregon , this Riverscape Mural depicts the Willamette River from Willamette Falls to the Columbia River. 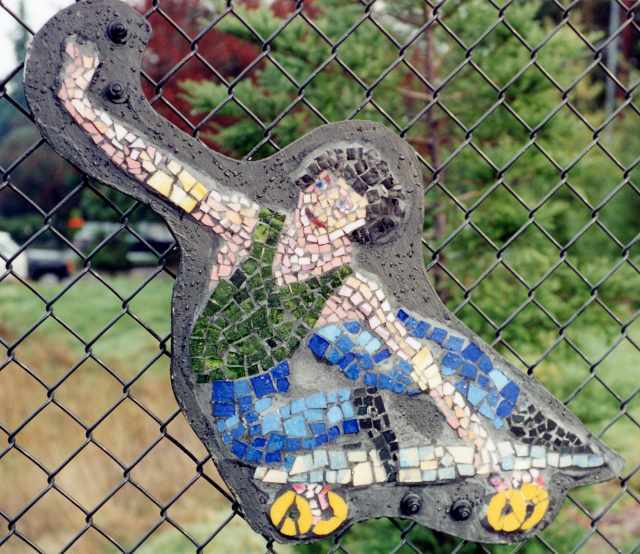 LO skateboard-enthused kids at Lake Oswego Skate Park created stained glass mosaic murals in just two weeks! Upon arrival to build a mural I found there were no walls. The solution was to cut plywood figures and mosaic them with stained glass. 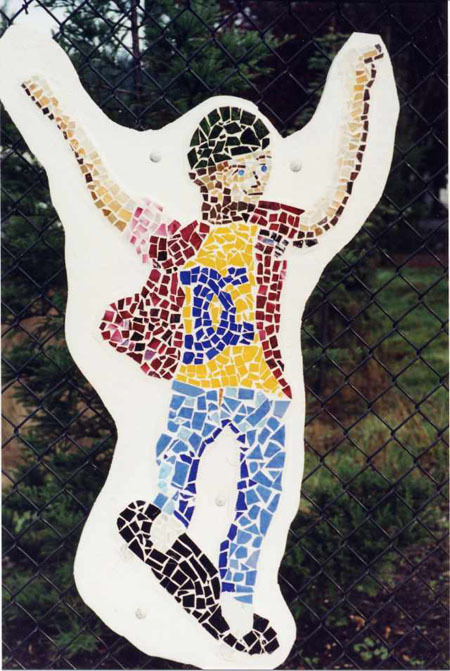 Eight young people drew the skater figures, learned to cut glass and assemble the mosaics which were bolted to the fence. Some figures were two-sided. Working time was 10 days, 4 hours a day. You can see these murals at the skateboard park in Lake Oswego. 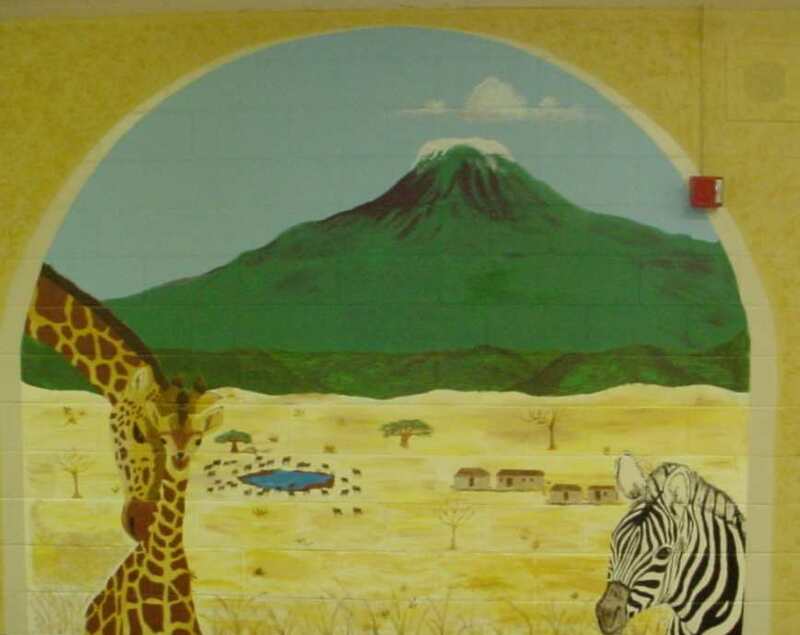 An 8th grade Talented And Gifted class at Jason Lee Middle School painted this 80 foot mural with Wendy. The school is located at 8500 NW 9th Ave in Vancouver, WA. 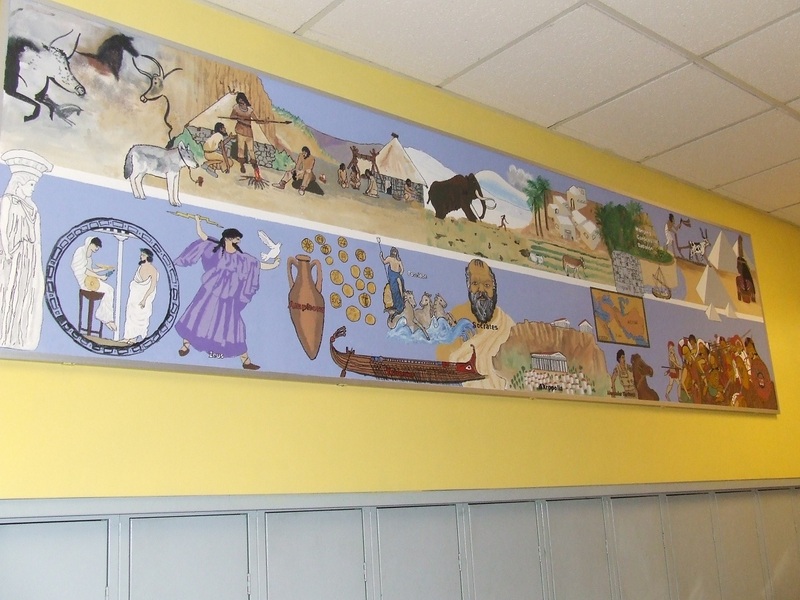 At Jackson Middle School murals depict diverse subjects such as the history of justice in the U.S. and how the geological landscape has changed over time. JMS is located at 10625 SW 35th Ave in Portland, OR. 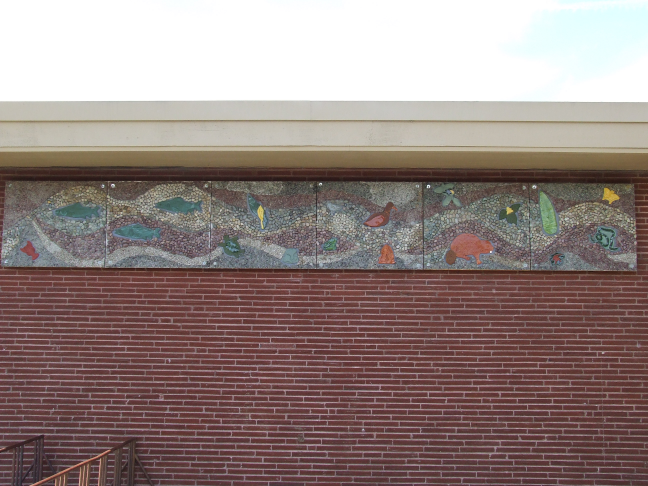 This pebble mural at Lake Oswego Junior High School mural is 825 square feet and has nearly a ton of pea gravel. 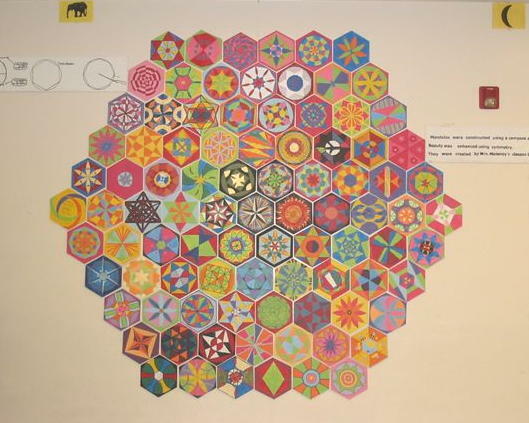 Art teacher Deborah Owen conceived and developed the interrelated science theme of water currents, fauna and flora. 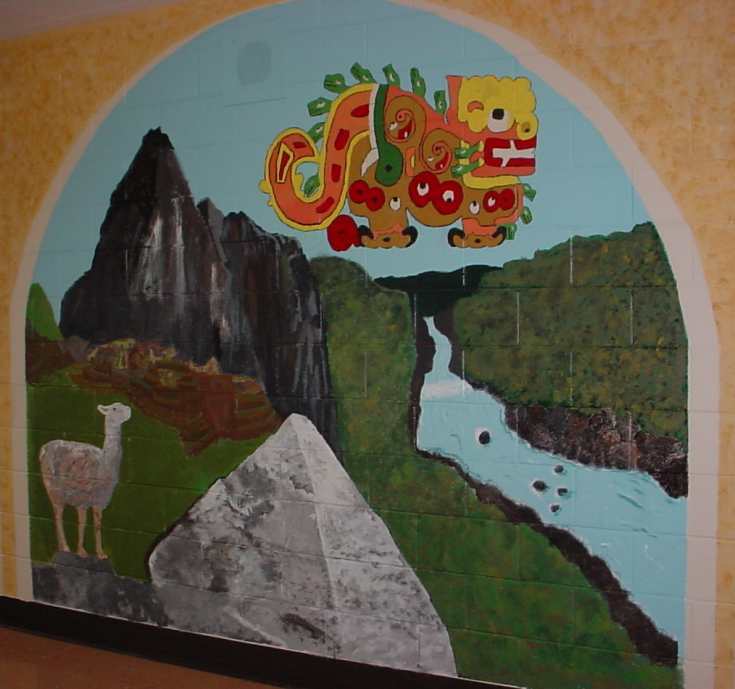 The requirement of this project was to work with 80 students for 4 hours for a permanent outdoor mural. The students sorted three quarters of a ton of pea gravel for color. With the help of a dozen adults the pebbles were Thinset onto backerboard. Spaces were left for ceramic figures that were made by art students under the direction of Mrs. Owen and attached later. The completion and installation required further work from Mrs.Owen and school staff. 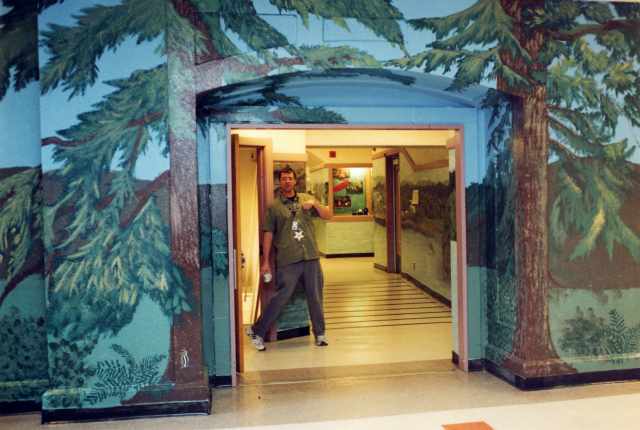 You can see this mural at the Lake Oswego Junior High School at 2500 Country Club Rd, Lake Oswego, OR 97034. 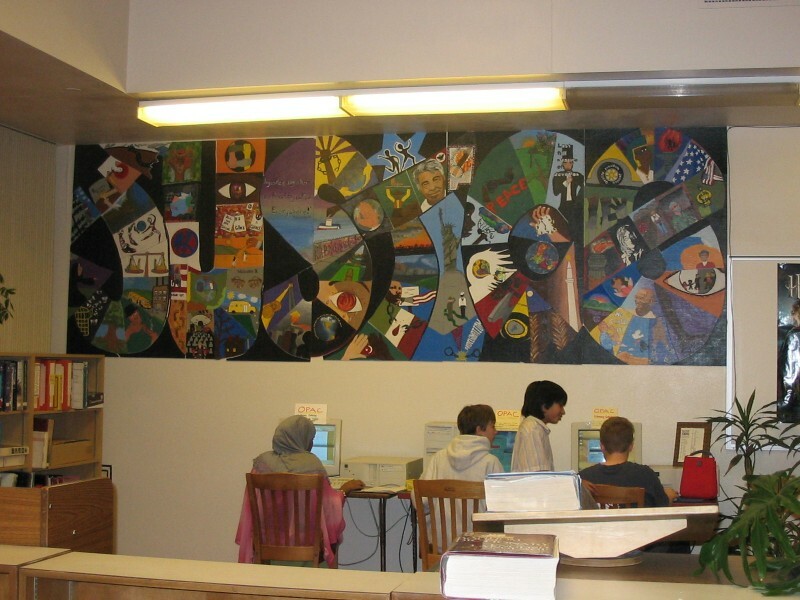 Tualatin Middle School art students created this mural that depicts Tualatin's history. My first mural for a public place was made from salvaged and donated ceramic tile. Students of Tualatin Middle School art classes cast concrete squares in a fiberglass mold I made with their design on the bottom like an upside-down cake. The squares had to be precise to fit in a precast niche in the concrete wall. The scene describes the general history of Tualatin from wilderness to farms to urban enviornment with examples of the recreation opportunities of it's parks. 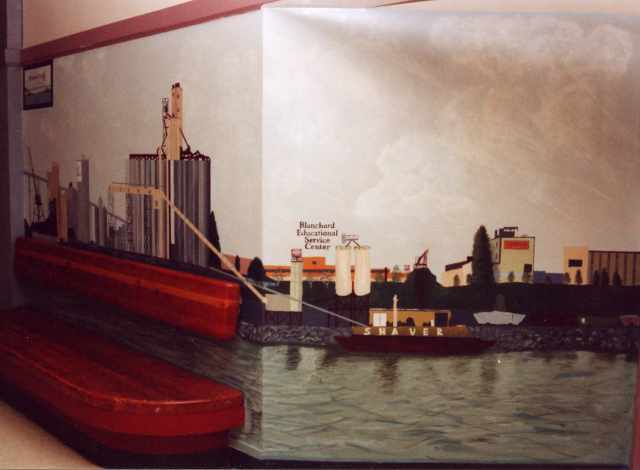 The mural is 2ft.x 40ft.